What Books Am I Excited For? Here are 4 books that come out tomorrow that I think you would love it you picked them up to read. Whether you collect these issues or just read them they will be 4 of the best books out this week. Seriously grab these 4 books because they will be the best reads of the week… Charles Soule and Cullen Bunn and the Axis event all in the same week have me excited to see what is in store for our Marvel Universe. We have 3 pretty good looking books this week that look like they are worth picking up if you aren’t already planning on grabbing them. Marvel has had a pretty good run as of late of having at least 3 books that I am excited to read every Wednesday. This week we have 2 Deadpool books and a book that corresponds to the #WCW Woman Crush Wednesday I have coming out tomorrow here on So Nerdy It Hurts. Deadpool v. X-Force #2 looks to continue the success that the first issue had. Written by Duane Swierczynski this mini series is retelling how Cable and the New Mutants met the Merc with a Mouth Deadpool by going back further in time to stop him from doing some stupid that only Deadpool can do. The first issue was pretty good even though I am a purest, this isn’t a bad re-imagining. I recommend this mini series to those who are Deadpool fans or just Marvel fans. 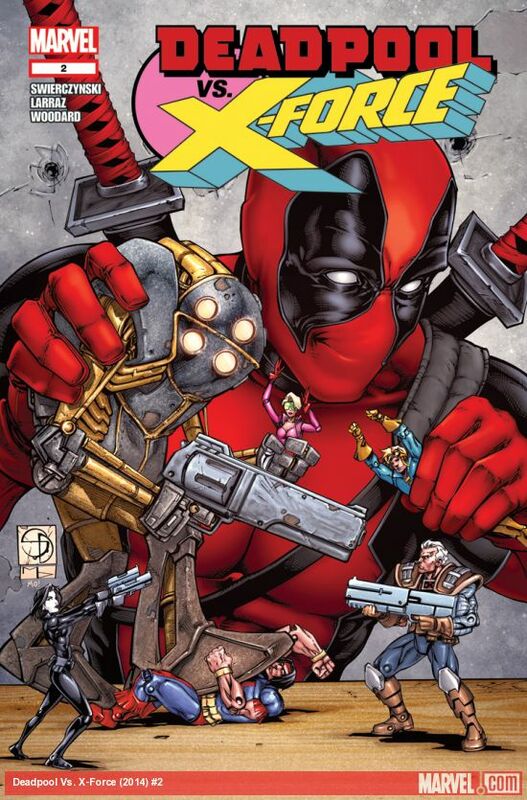 Deadpool #32 by Gerry Duggan is a continuation of the crossover from the Original Sin event. Dracula and his forces still have Deadpool and “Dazzler” hostage and Bob, Blind Al, Outlaw, Preston is trying to figure out something important from Deadpool’s past. I am still just waiting for Duggan’s run to end, but I am surrounded by people who love his writing including Cullen Bunn. You can hear our interview with Cullen Bunn here on Nerd Management. Thief. Goddess. Headmistress. Queen. The X-Man called STORM has always defied a single title. And her desire to better the world has never been limited to only her own kind. 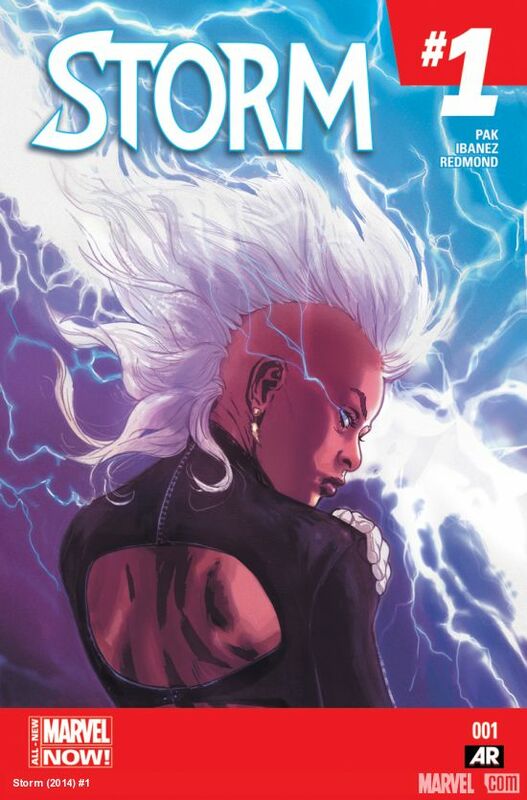 On a mission to foster goodwill and safeguard the mutant race’s continued existence in her own way, Storm will travel the globe, confronting man and mutant, god and monster and everything inbetween. She will overthrow tyrants, quell tsunamis and strive to see her dream for the world realized. She is STORM, a hero like no other….and the skies will tremble at the sight of their namesake. All 3 of these books look great and I am know I will enjoy reading them after I pick them up. If you aren’t reading these 3 I recommend picking them up I know you will not be sorry. Marvel actually has a few good books coming out this week that I am pretty excited for. Now I know what your thinking, books don’t come out on Tuesdays. I know but I have changed the format on the blog so that Wednesdays are now Woman Crush Wednesdays and I will be putting out the books I am reading on Tuesdays now. 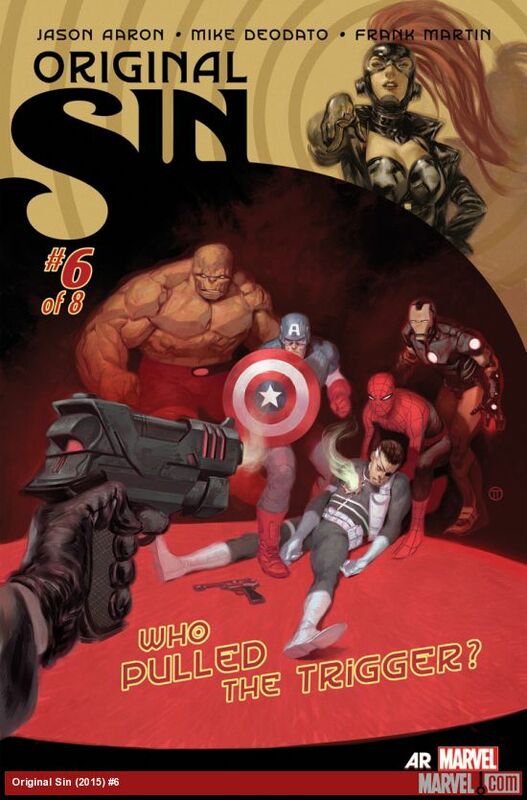 Original Sin #6 by Jason Aaron finally reveals who shot Uatu the Watcher. It has been 6 issues and countless crossovers but we will finally learn who actually pulled the trigger and took out the Watcher. Based on the next Marvel Event my money is on The Red Skull. Magneto #7 by Cullen Bunn looks to be on par with the other 6 issues as a very spectacular issue and one of the MUST Reads that Marvel is putting our right now. Magneto has to make a choice, how far will he go to save mutankind? If you are not reading this book you are missing out. 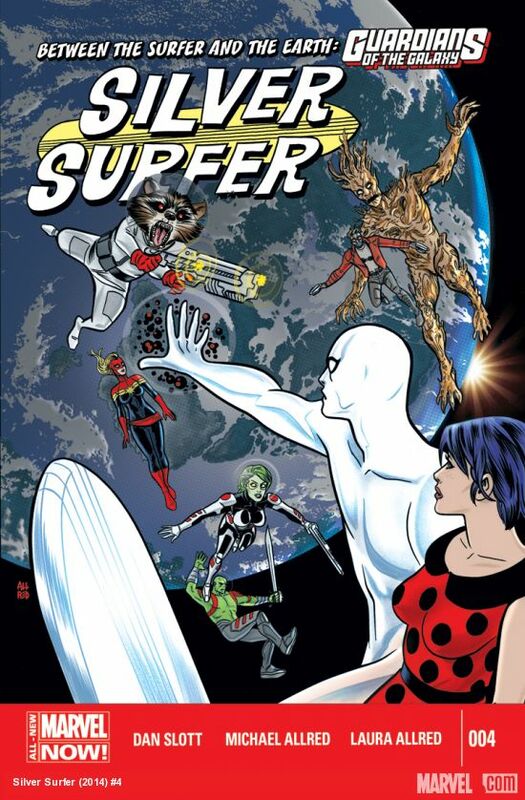 Silver Surfer #4 or The Doctor versus the Guardians of the Galaxy by Dan Slott. This book is good much to my chagrin and this issue looks pretty darn good as well. The Surfer has to return is companion home to Earth, he doesn’t exactly like it there. Shenanigans happen. Marvel has been on my crap list lately. They have an opportunity to redeem themselves very soon with the next Event after Original Sin, but I am not holding out too long after if it is terrible. These books are awesome, and the Event that is happening right now is great. What I’m Excited About This Week! A few books are coming out this week that still look pretty darn good that Marvel is putting out. 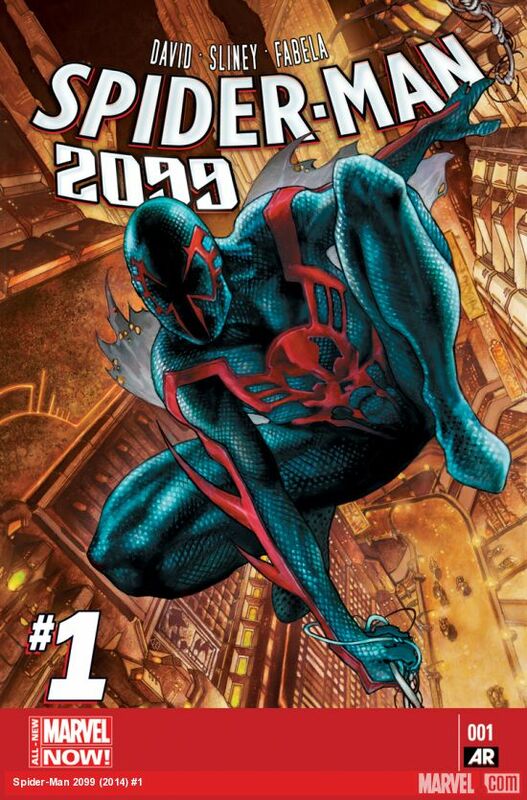 The first one I am extremely excited for Spider-Man 2099 #1 by Peter David. The cover is by one of my top-5 all-time artists Simone Bianchi so I am extremely excited for that! The story looks pretty solid too bringing Miguel O’Hara from the future to 2014 and putting him against an enemy that doesn’t exactly see eye-to-eye with him. 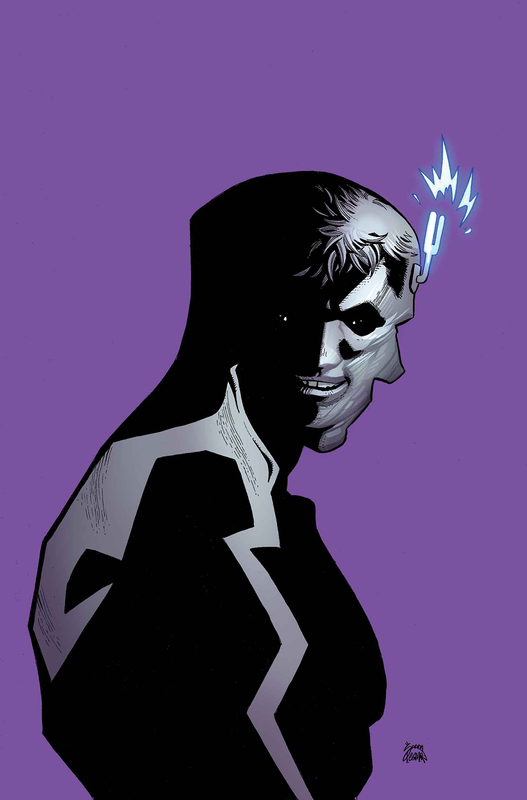 Marvel’s Original Sin #3 by Charles Soule reveals J. Jonah Jameson’s original sin while the Inhumans and Young Avengers track a foe. This has been a bumpy Event for Marvel. It started off strong but has completely fallen flat here in the middle. The fact that there are too many tie ins I think is hurting the whole Pre-Axis storyline, er.. I mean Original Sin Event. Nightcrawler by Chris Claremont was a little shaky at first but it has turned into a darn good read. 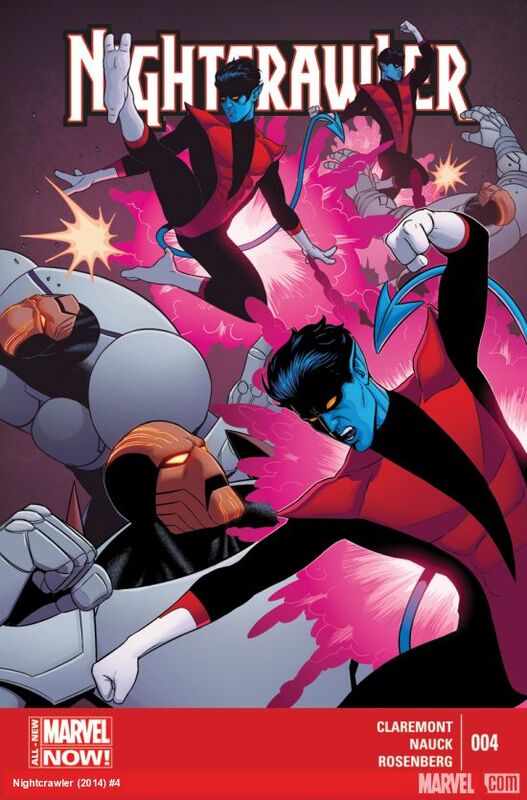 I am looking forward to #4 which comes out and Nightcrawler has to choose between his family and the X-Men. Whoah! Deadpool #31 comes out and it is still a Buddy-Cop book, which was fine 8 years ago when it was a team up with Cable; but right now he is teaming up with “Dazzler” against Dracula. I am sure that Poeshn and Gary Duggan mean well, but this story line is just not doing it for me. I am excited to get this book right now only to add to my extensive Deadpool Collection. YIKES!!!! NONE!!!! Litterally no books intrigue me this week. 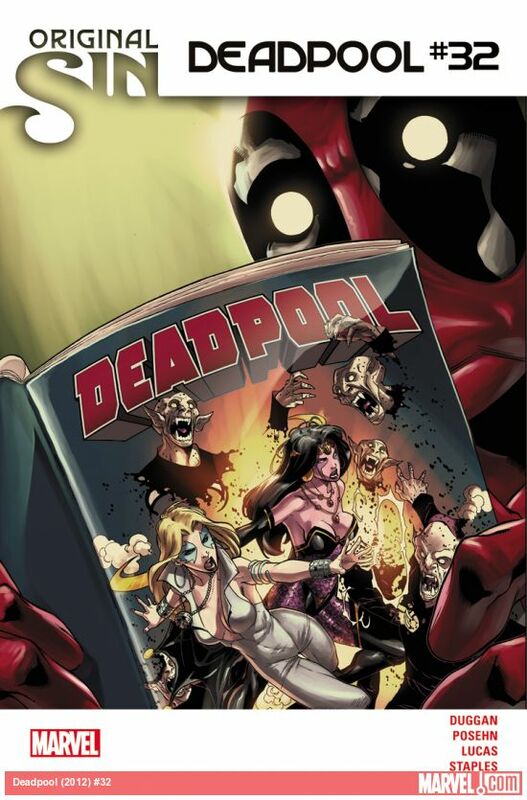 I mean Deadpool #30 the Orignal Sin tie in comes out featuring Dazzler and written by Gerry Duggan. But with how terrible that book has become, an unbearable read as-of-late, its hard to even look at it. The first story arc with the zombie presidents was awesome, but ever since then the book has felt just like a money grab. They know they have a commodity in Deadpool, Marvel does. They know people will buy it just to collect it, even though it is garbage. ENOUGH with the Shield Agent sidekick. We get it, its ironic since he used to hang out with an Agent of Hydra. Marvel is going downhill fast, and there are not very many books I read anymore, mainly because of the price point most of the books are at now. The prices keep going up and up and pretty soon a 3rd Deadpool Annual will be coming out in less than a 12 month span. That is bologna! What on Earth does Marvel think they’re doing? Apparently anything they want. 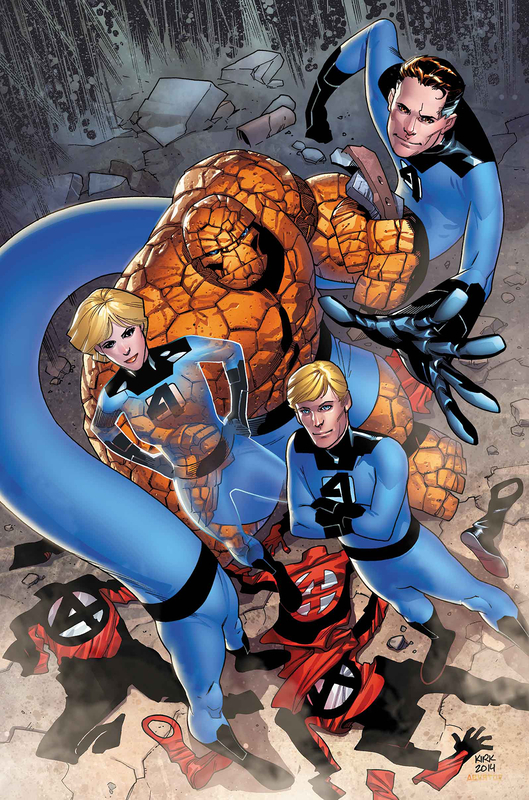 From taking down all of the Fantastic Four stuff in their offices to banning artists from drawing Fantastic Four covers; Marvel has jumped the shark and not even the Fonz came back from that. Maybe I can take this week and catch up on bags and boards for my comics, I have some laying around in nothing. I need a long box as well. So there are things I can spend my money on at Comic Book University other than the 1 comic. Who knows maybe I’ll grab a trade or 2, that would be fun. I would love to find the Agent-X TPB or some Joe Kelly run Deadpool, you know back when it was good. I will even give Daniel Way credit even he is better at writing than the current team on Deadpool. I wrote an article about Cullen Bunn taking over for Deadpool and how if he did a Magneto and a Deadpool ongoing than that character would finally be in the right hands. GET YOUR ACT TOGETHER MARVEL! 3 books this week have caught my eye. All of which are normal pulls for me, so nothing out of the ordinary for me this week. I am looking forward to reading Magneto #5 by Cullen Bunn which is hot on the heels of the Schindler’s List type of ending #4 had. Cyclop’s #2 by Rucka; #1 was a little disappointing but I am going to give it 3 issues. It is more buddy cop than I expected, then again I don’t know what kind of hopes I had for it was going to be so that may actually be my own fault. Finally book number 3 is Original Sin #3 by Jason Aaron. The 1st 2 along with the tie ins are making for a pretty good mini series Event from Marvel. Each installment is better than the last and leaves you intrigued. Not many recent Marvel Events have done this. I am anxious to see what Marvel’s next event AXIS will do. 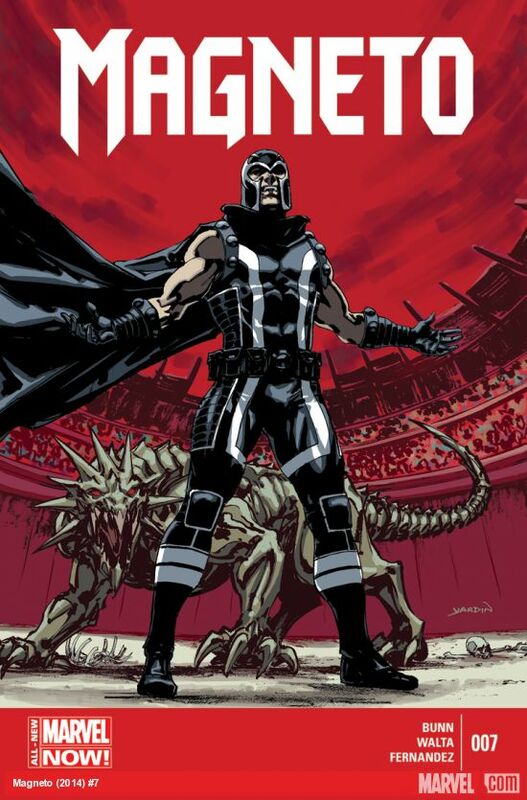 So check out Magneto #5 by Cullen Bunn as we follow the villain Magneto as he searches for something. Something that when he knows what it is he is looking for he will be able to level the playing field once again for the mutants against the humans. Cyclops and father in tow Corsair make an awkward team up and I am going to wait it out 2 more issues, but I am not holding my breathe on this one. Original Sin is a solid Marvel Event. I am excited to see where it leads. So check out these 3 books. I am sure that even if you are picking them up already you know what good books are like. Like I said if you pick up Cyclops and you like it, tell me what I am missing below here in the comment section. I would love to hear from you. This is a pretty light week for me with only having 2 books that I have coming out this week. 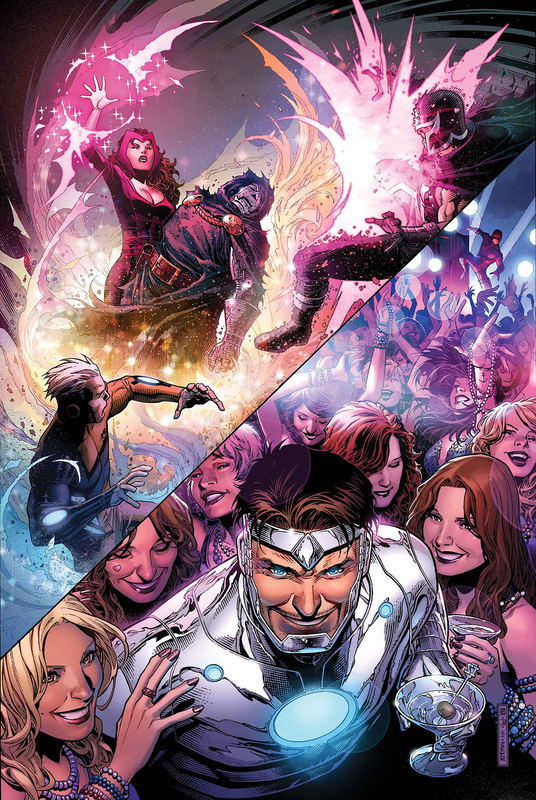 Both are issues in ongoing series, and one of the 2 is a crossover with Original Sin. Last week having 5 books it is no surprise to me this week is pretty light for me. Deadpool #28 and Avengers #29 both look super good this week. 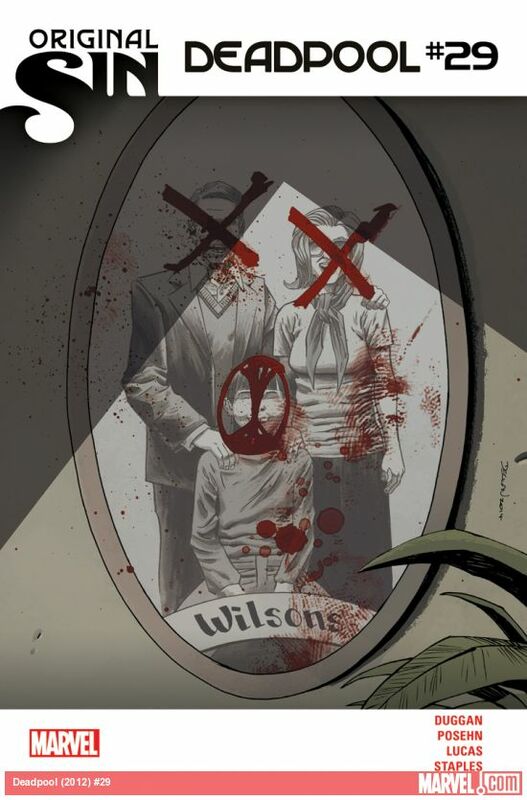 Deadpool #28 written by Gary Duggan is the first issue after the “Wedding Event” $10 issue of Deadpool. 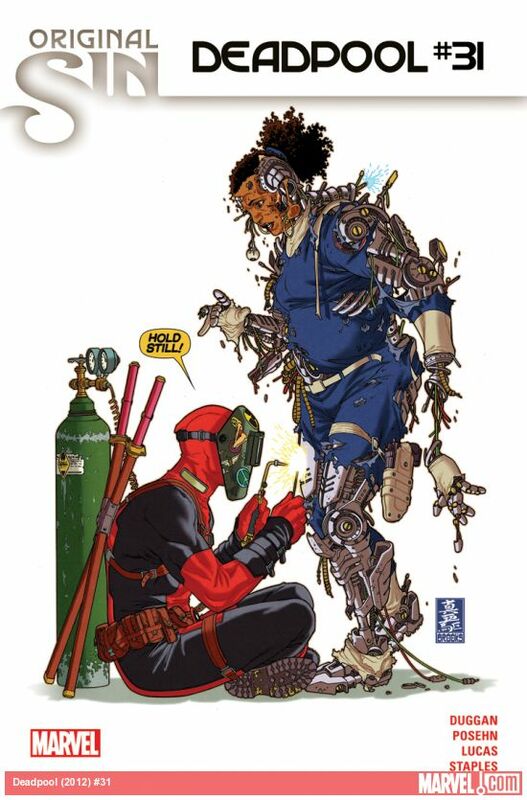 The price point of Deadpool #27 was very annoying, and really didn’t live up to the hype. This issue is the Honeymoon for Deadpool in Japan but it went back to the normal $2.99 price so I can get over it pretty quickly. Avengers #29 is a part of the Original Sin event in the Marvel Universe written by John Hickman. This issue seems to feature Dr. Strange’s Sin. What do you think Uatu the Watcher saw that Dr. Strange doesn’t want revealed? Does it have something to do with the Illuminati? Will Steve Rogers react to this secret in anger? Find out today! Like I said its a light week for comics, check out these 2 is you aren’t already picking up books or if you are looking for something new to read. I highly recommend them, especially Deadpool. This week we have 5 great books I think you should take a look at if you already aren’t picking them up. 3 of them are #1’s and the other 2 are in established series’. Now I am sure there are more out there but these are the ones I am going to be picking up this week and I think you should too. 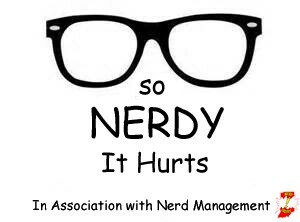 If you want to hear about more books check out Warner, Alec, and Rob over at Nerd Management for more of a variety. I only read Marvel, and they dabble in the other companies as well. The First book on the docket is Cyclops #1 written by Greg Rucka. 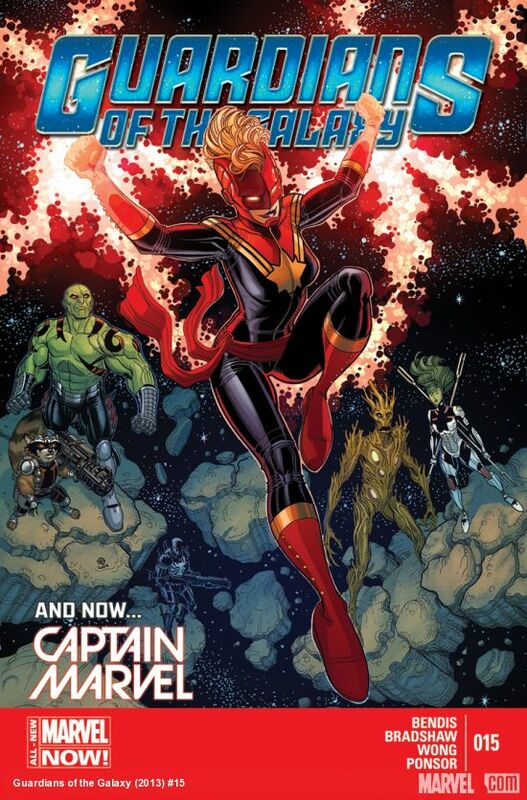 This book is a spinoff from the X-Men and Guardians of the Galaxy crossover “Trial of Jean Grey” event and it pairs Scott and his father Corsair in a space adventure. The space and universal aspect of the Marvel Universe has always been a favorite of mine, that with the mutants will possibly make this one of my all time favorite books. As long as it is handled correctly by Rucka, that is. 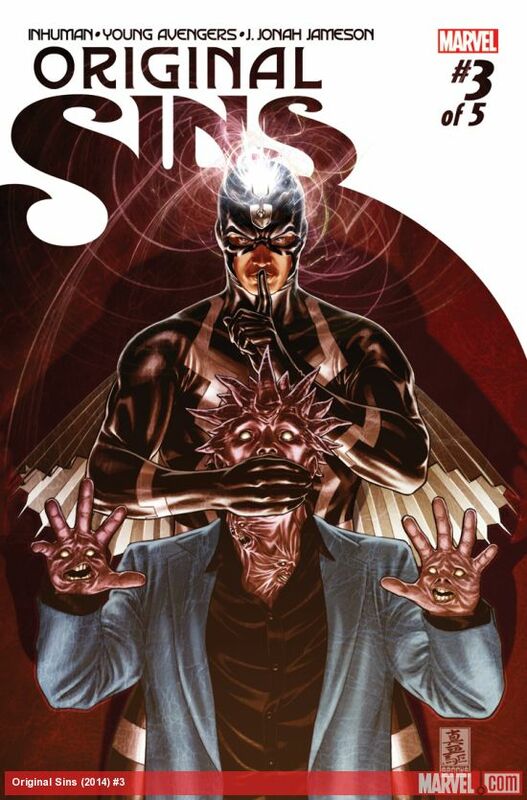 Next up we have the Marvel Super Event that is Original Sin which kicks off with its first issue here. Written by Jason Aaron this “Who Dunnit” type of event centers around the death of Uatu the Watcher as the Avengers find the Watcher dead on the moon with both eyes missing. The tagline of Who’s Watching us Now? seems to make you think someone already established has killed Uatu and stolen his secrets. Who could it be. This is the most I have ever been excited for a Marvel Event since Civil War. Ultimate Spider-Man #1 by Brian Bendis is yet another incarnation of the Universe that needs to go away. The problem with that is this is the only book that looks any good and the Marvel Movie Universe feeds mostly from the Marvel Comics Ultimate Universe. So it is a double edge sword. I am looking forward to this book because Miles Morales as a character is really great, even though he lives and exists within the awful Ultimate Universe. Cullen Bunn has 2 incredible books out this week Deadpool v. Carnage #3 and Magneto #3. Both are so good and so well written. The art on DvC is lacking but the story makes up for it. 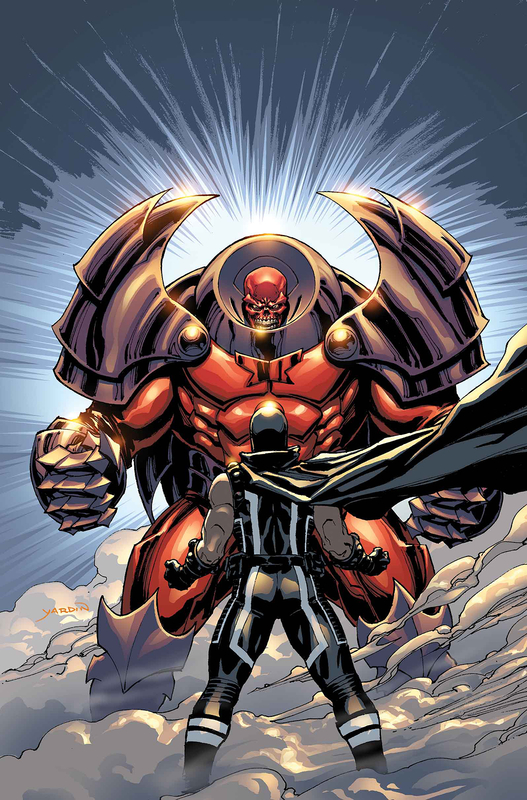 Everything about the Magneto book makes it my favorite book to come out in the last 3 years. I really suggest picking up both of these if you are not already reading them. So there ya go. These are the books I am picking up this week to read, and I suggest you do the same. The best up and coming writer Cullen Bunn has 2 of the most popular Marvel Characters in his capable hands, while Bendis continues a success that only he could with Ultimate Spider-Man, while Original Sin and Cyclops look solid as well. Marvel is really doing a lot of things right, right now. Hooray with New Comic Book Day!